Preschool Playbook: I Know My Colors! 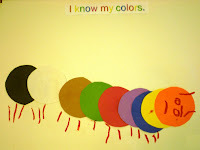 The children make what I call a color caterpillar. The heading on the page is "I know my colors." I have circles cut out of the nine basic colors we discussed. I sit with each child and ask them if they can tell me the names of the colors. Sometimes children find it very easy to "point" to the color you ask them, but "telling" you the name is a little different. 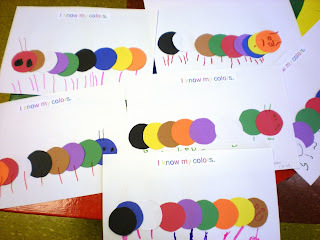 After they tell me the names, I give them all the circles and have them glue them down to make a caterpillar, then use a marker for eyes, feet, and antennae. It is really cute to see all the different caterpillars you will get. The children did great. Out of all 14 children there where only 2 that mixed up black and brown--I was pretty impressed. Another great assessment piece. I am definately going to share this one with one of our newer teachers. i do ice cream cones w/ my 2 yr old but the caterpillars are super cute i might have to change to that!